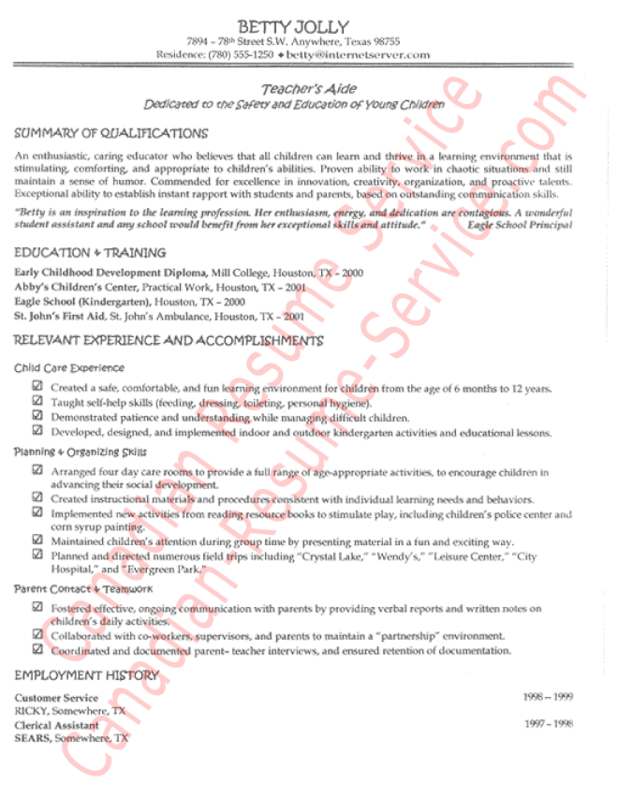 Check out this teacher’s Aide resume example, which was put into a functional resume format. She is a mom who had completed her diploma in Early Childhood Development but had only part-time, non-relevant paid jobs. She had, however, completed her student teaching practicum, so we used that experience to the fullest. Betty’s education resume was developed using a functional format, which is often the best choice for career changers. We placed her education and practical experience first so they would be noticed. Her three relevant skill sets deserved special emphasis. Highlighting the proper abilities generated interest and won interviews. TIP: If your work history is less than perfect, call us! With our experience and expertise, we solve these challenges easily. No matter your past, we’ll write a resume that claims employers’ attention. Read this teacher’s aide resume example below.